When I joined Caterpillar after college, they put me into an Engineering Rotational Development Program. For 18 months, I learned the ropes, met new colleagues, figured out how the company worked, asked questions, messed up, and fixed my mistakes. It was a neat experience, but I didn’t do a lot of useful work until my second year. If you’re a new grad at a big company like Facebook, Google, or Goldman Sachs, you also might have a 12–18 month ramp up period. You’ll definitely be thrown into the mix, but you’ll have plenty of help and training along the way. Most mid-career hires don’t have this luxury though. You need to get up to speed quickly and start producing. And if you’re joining an early stage startup, there’s a good chance that your job didn’t exist until now, and you’ll be the first one to do it. By 5:30pm, you should be excited to get started on your first project and your laptop, passwords, 2FA, email, etc. should all be setup. Of course, that’s just the beginning. We don’t expect you to push code or know everybody’s name on Day 2. 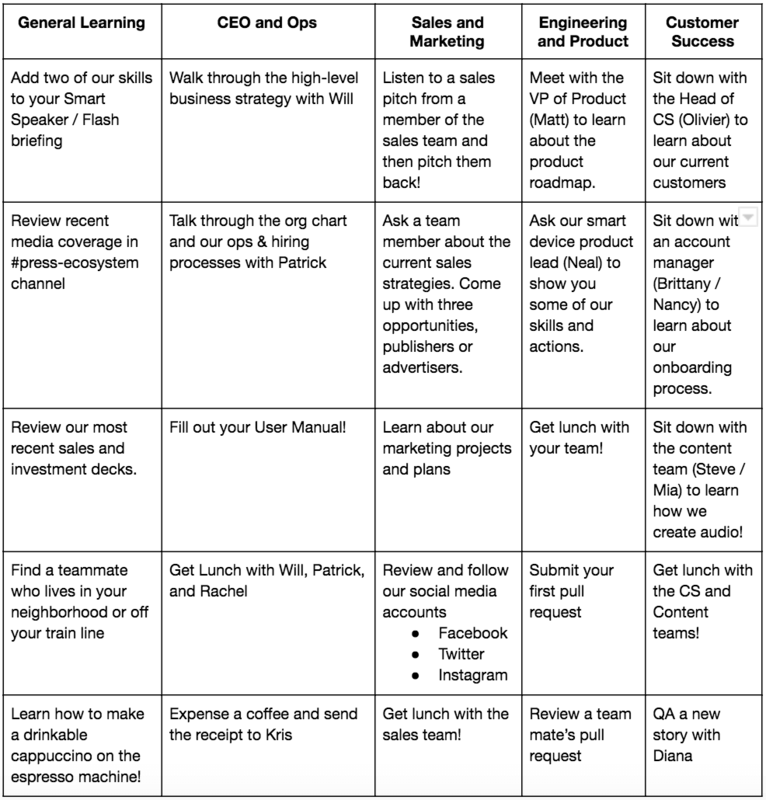 For the next two weeks, you’ll work 50/50 on your primary project and a game I call Onboarding Bingo. Every day you’ll complete 1–2 tasks on your personalized Bingo card. Each square represents a small task or meeting which will help you get familiar with our team. You’ll leave each meeting with an understanding of the team’s timescale, goals, metrics, challenges, current projects, and how they intersect with yours. You’ll also learn about our mission, office, inside jokes, and what makes us all unique. By the end of your first two weeks, you’ll be able to review & submit pull requests, recite our elevator pitch, and pull a shot on our espresso machine. And, hopefully, you’ll be as happy to be here as we are to have you!